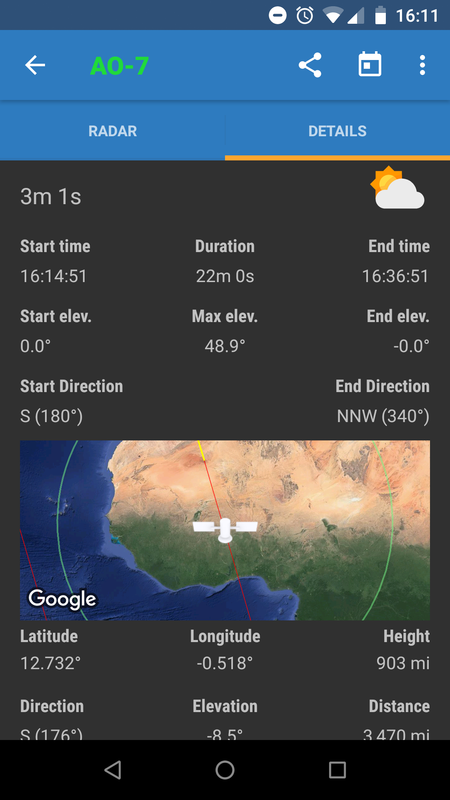 Satellite tracking applications play an important part in using the transponders available to radio amateurs, of course, experiences of them all vary and are very subjective however we are going to explore what is available on the Android platform. 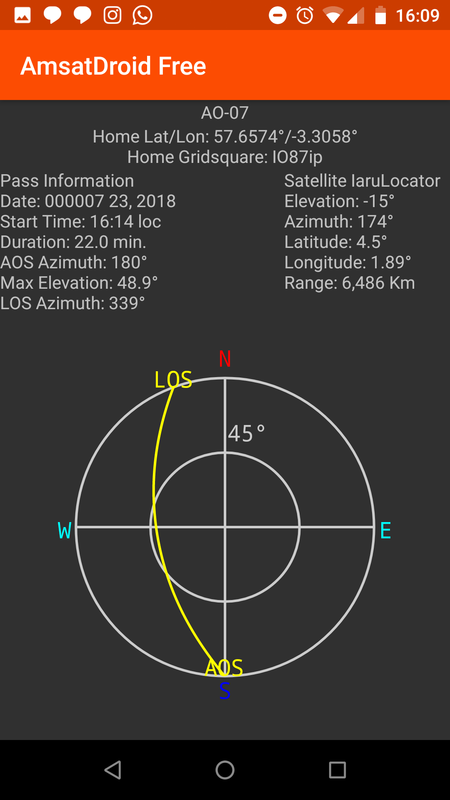 AMSATDroid Free has been the staple choice for most keen AMSAT operators, created by David G4DPZ and provided free to the community it allows you to see the next passes for individual satellites for a period of time when you select a pass it gives you a graphical display of the pass on a compass style view or a map view which includes the track of where it’s going to be. 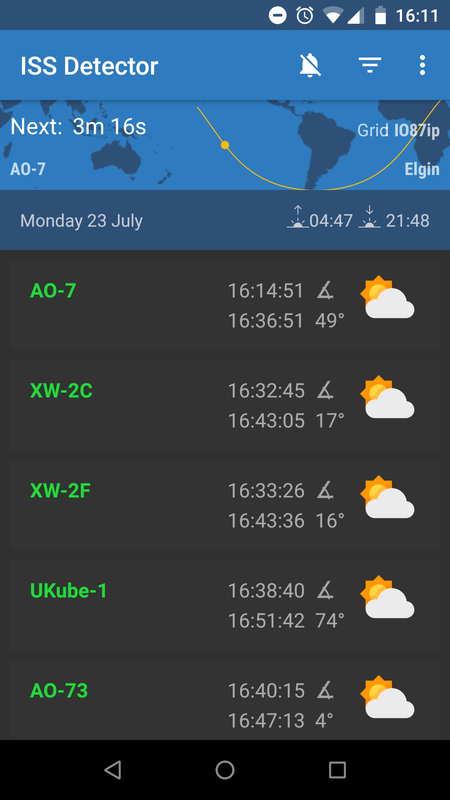 Heavens-Above Pro has been my favourite satellite tracking app when on the move, its amateur radio features allow you to search for an amateur satellite you’re after, it then gives you passes for the next couple of days along with pass times and a rough guide for the uplink and downlink. 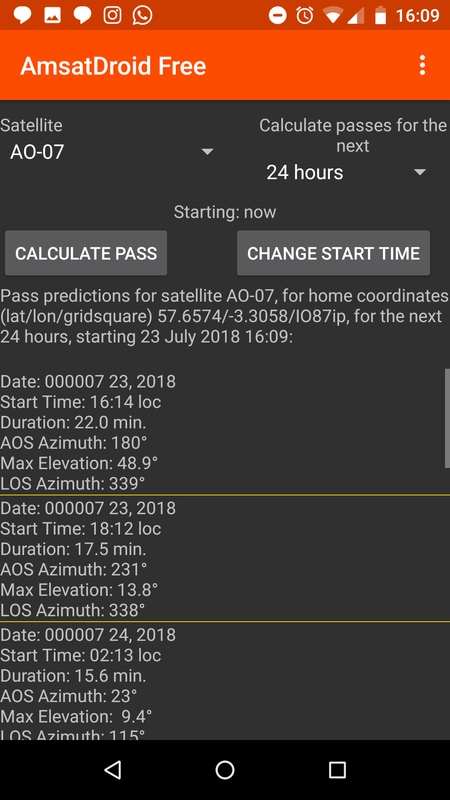 On selecting the pass of interest you get a compass view which updates in real time showing where the satellite is, it also gives a detailed break down of a pass from the start (AOS) to the end (LOS) including the time the satellite is at its maximum elevation. A useful function in Heavens-Above is that it allows you to create calendar entries for the pass, thus helping you plan your trip. 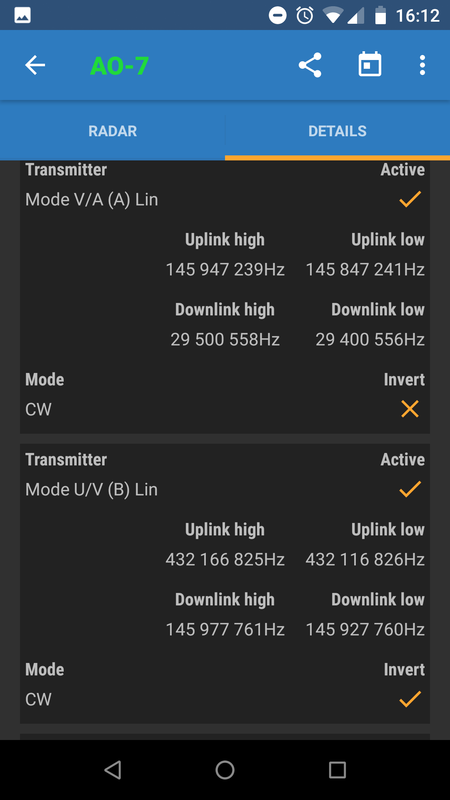 Within the settings, you can also define some of the options like the minimum elevation so if you can’t work below 10 degrees elevation you can set that. 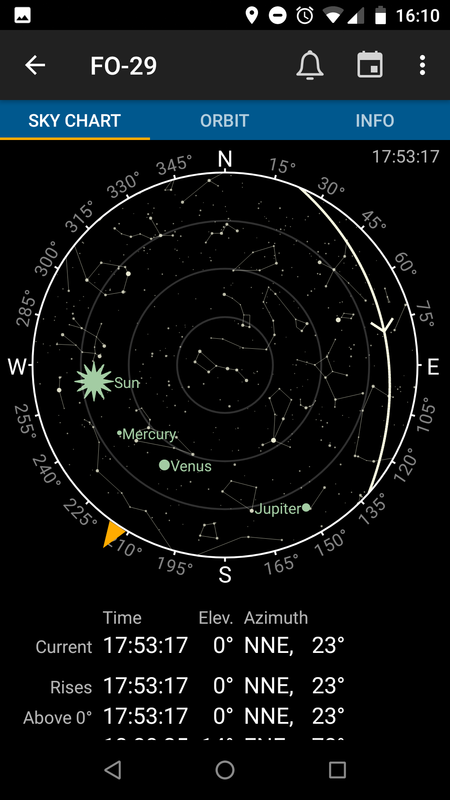 ISS Detector has become the most popular application for satellite tracking in recent months with its huge range of features it offers, although you have to buy the Amateur Radio Extensions which cost around £1.09 via an in-app purchase it’s well worth it. 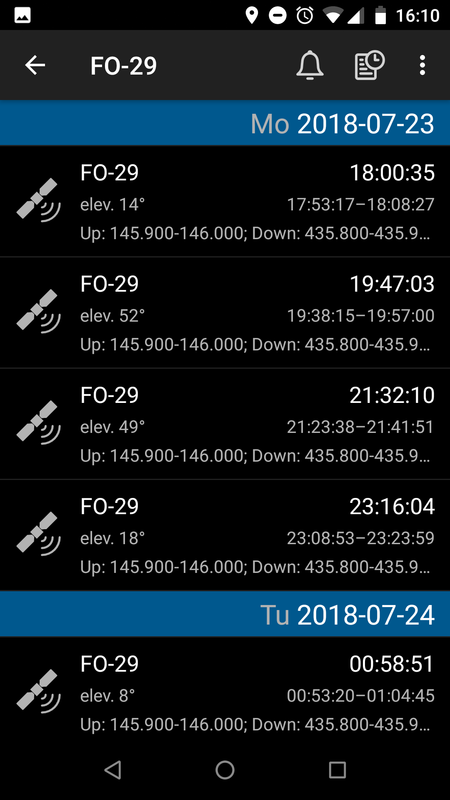 Once you have purchased the addon you can create a filter to include the active ham radio satellites that you are interested in and set a minimum elevation plus whether you want ISS Detector to popup a notification when the pass is due within 5 minutes which is useful. Returning to the main screen you a full list of next passes based on your filters these are in chronological order. 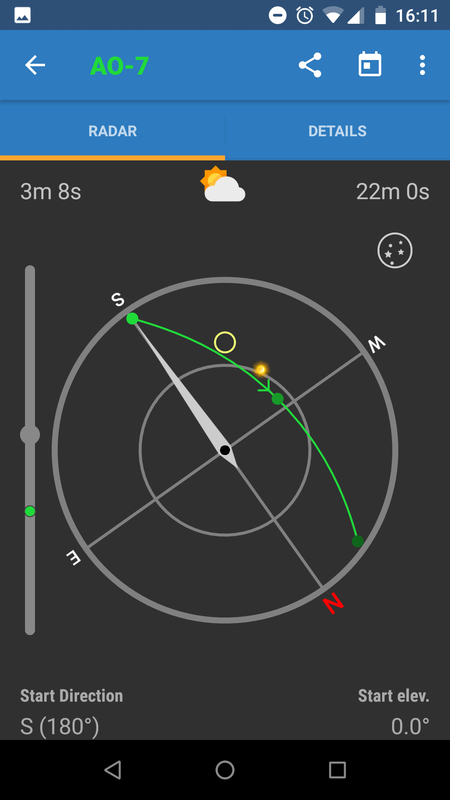 When you select the pass you get a wealth of information displayed in the RADAR tab you get a compass view of the pass you help you with antenna pointing, selecting the details tab gives you a finer display of the pass times and its elevations along with a live Google Map of the satellites current position. 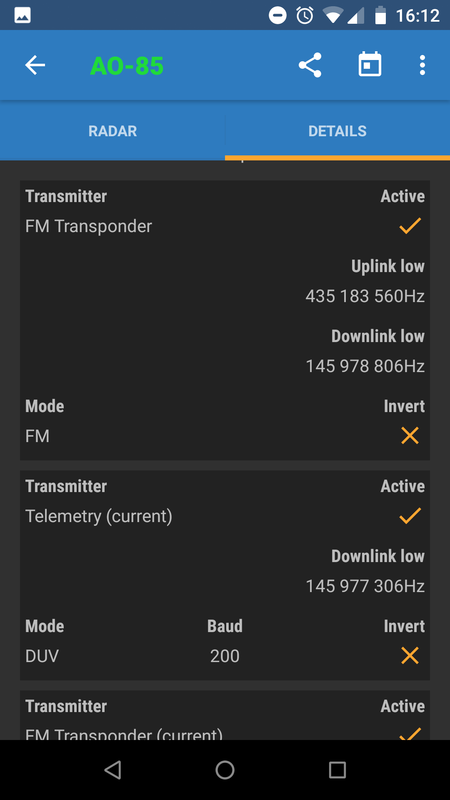 The interesting part of this tab is when you scroll down it gives you doppler information, for a linear satellite you get doppler corrections for the top and bottom edges of the transponder, on FM passes you get the uplink and downlink, this can be a useful guide on where you should be listening and transmitting. Within the satellite view, you also have the option to create a calendar entry if you’re planning a day trip or even share the pass with friends. As with any application, there’s a huge selection of settings options to go through and adjust to your liking but once you have it set up it’s straightforward to use. 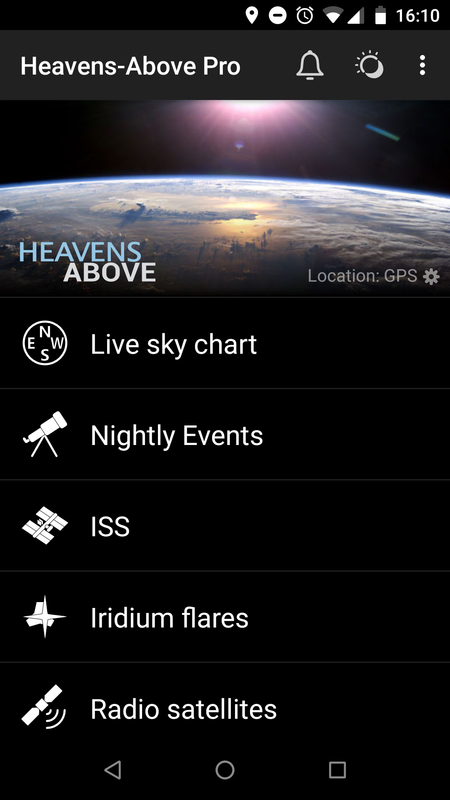 Hopefully, this gave an insight into some of the options available, I’ve not been paid to recommend any of them and paid apps were bought with my own money, I will say that ISS Detector is my main go-to application for planning passes whether at home or even portable the notifications, calendar and filters just make it simple.